NASA's Opportunity Mars rover has been silent since June 10, a casualty of a mega-dust storm that encircled the Red Planet and led to a halt of the rover's operations at Perseverance Valley. But Oppy's handlers haven't given up yet on the golf-cart-size robot, which touched down on Mars in January 2004. 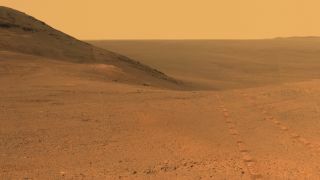 "Still holding onto a sliver of hope that an almost 15-year-old rover living under extreme conditions for a very long time will wake up and talk to us," said Ray Arvidson, Opportunity Deputy Principal Investigator of Washington University in St. Louis. "We will continue to actively try and communicate with Opportunity at least through January," Arvidson told Inside Outer Space. In the meantime, Arvidson said, he has started drafting an Extended Mission-12 proposal on what Opportunity would do if the rover did get back into operations. The plan is due to NASA in mid-February. "We don't want to be caught off-guard with no proposal and a revitalized rover coming back online, say in late January," Arvidson said. "The windy season is just beginning, so it may happen." Winds could increase over the coming weeks at Opportunity's location on Mars, possibly resulting in dust being blown off the rover's solar panels — and perhaps allowing the six-wheeled robot to finally wake up.